Cañon City, Colorado seems to be known for few things. 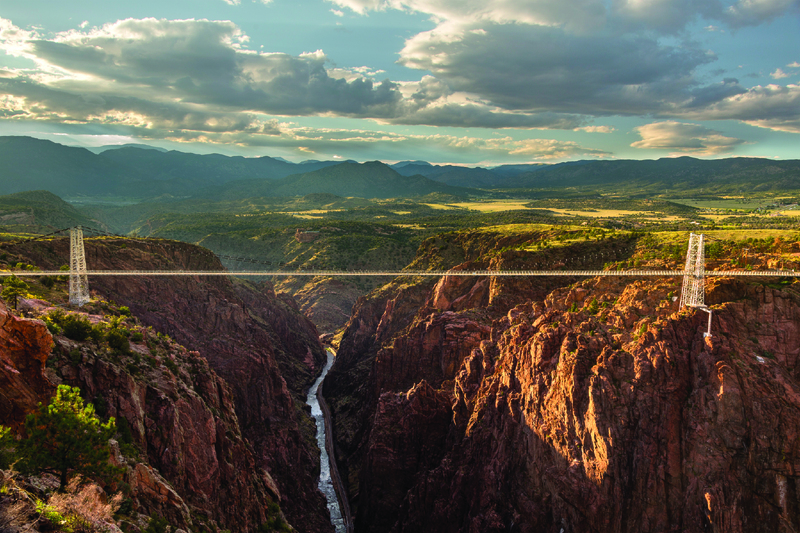 To those outside Colorado who have heard of it, it’s all about being the gateway to Colorado’s famed Royal Gorge, an astonishing geologic feature that is over a thousand feet deep but not so far across, making it a shock to the eye and a favorite tourist attraction for many Colorado visitors. Over a half million people a year test their nerve on the drive across the world’s highest suspension bridge, and many more simply come to peer into the abyss or ride a train or whitewater raft through the gorge. But tourist season is short, and for those who live in the region year round, Cañon City is famous for a couple other things. 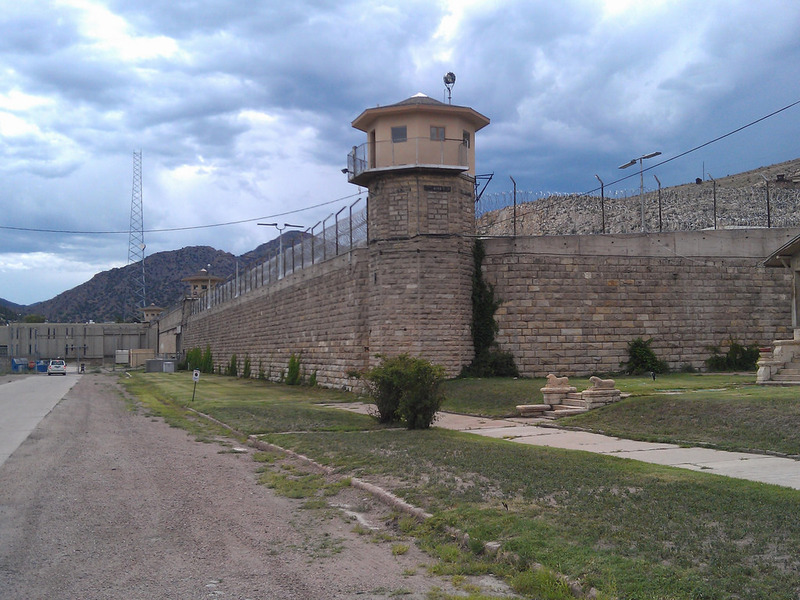 First, this small city at the exit of the Royal Gorge and the Arkansas Valley is home to an almost disturbing concentration of major prison facilities. Before Colorado was even a state, Cañon City was home to the old Territorial Prison, and since has added over a half dozen more prisons to the area, including the Colorado State Penitentiary, a large women’s prison, and a Federal Supermax which has held major crime family members and high ranking foreign and domestic terrorists including Oklahoma City bomber Timothy McVeigh. Having grown up in the high mountains just north of Cañon City, I also knew it was the final stop for many Colorado residents as they reached their golden years. Elderly high mountain dwellers often needed to go down in altitude, but didn’t want to move too far away, and others simply wanted a nearby spot that wasn’t below freezing eight months of the year. Small, affordable, Cañon City offered the perfect mix of lower and warmer, but not too distant, so the age profile of the city skewed upward for many years. It was kind of a local version of Scottsdale, Arizona or south Florida. With relatives in the area, I spent a good deal of time around Cañon City, and as is my wont, I usually took my bike with me and did some exploring. But even with all the very rugged and interesting terrain there, the mountain biking in the area was really wanting, so I wrote it off for the most part. Then, about a half dozen years ago, I noticed a new trail open up, so I hit it, and it was good. The next year, another, even better trail system debuted. 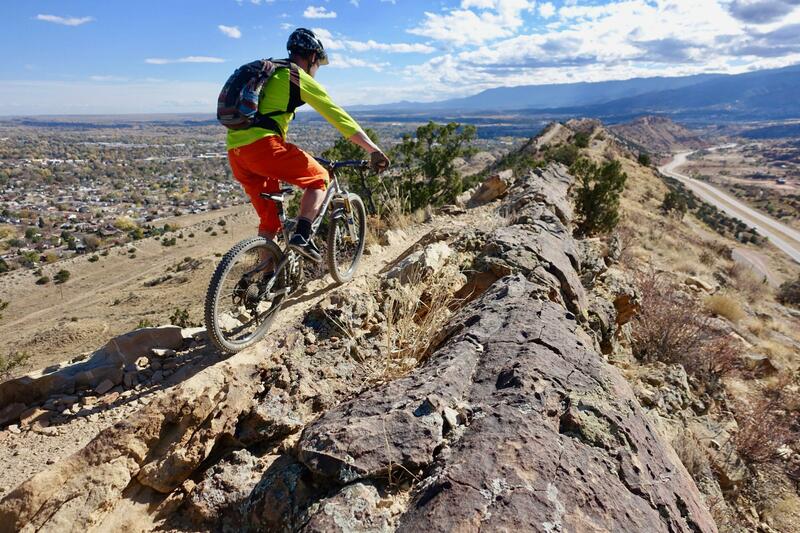 For a while, it seemed like Cañon City was launching new, top-quality trails every year. 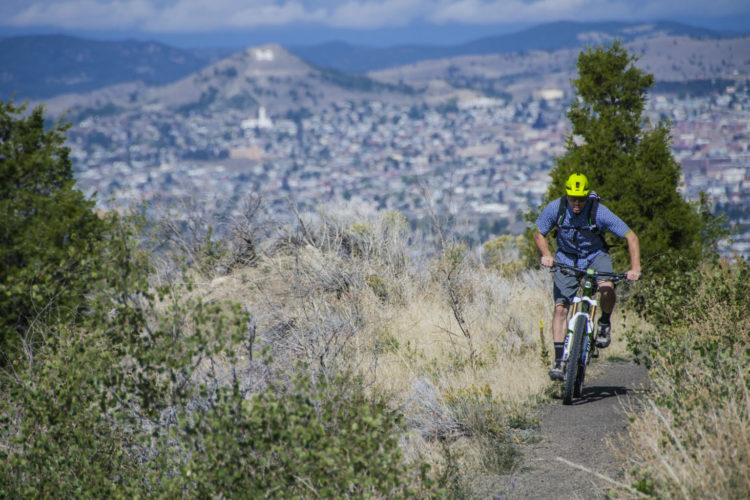 Having made it a regular destination of mine, and being amazed at the proliferation of great trails, I made it a point to learn how this little city, which I perceived to be mostly prison workers and old folks, became such a hub of great mountain biking. The Tanner/Stultz loop was one of the area’s original rides, but aside from some nice scenery, offered little incentive for the mountain biker. I had the good fortune to be able to spend an evening with Brian LeDoux of the Lower Arkansas Mountain Bike Association (LAMBA) to gain a little insight about how this unlikely locale became such a great mountain biking spot. In a way, it is a simple tale, with nothing more than good folks working together to make good things happen. At the same time, there’s a little bit of magic there, which somehow brought all the right elements together at the right time to allow a nascent bike culture to flourish and, most gratefully for the rest of us, to give us cause to show up with our bikes. Outside of the tourist attractions, Cañon City wasn’t known for having much to do, especially for kids. There were parents in the town who thought it might be nice if the kids had accessible, healthy outdoor activities, and many of these parents had mountain bikes. This seemed like a synergistic meeting of objectives. At about the same time, these sharp-eyed folks spotted an opportunity. On the west side of town was a rugged hogback that was owned by the city. This hogback had long been a favorite place for the motorized crowd, but their use was controversial for a number of reasons ranging from resource impact to noise complaints from the residents living at the foot of the hogback. Eventually, the motors would be banned from the area, but quiet, human-powered, low-impact travel need not be. Spotting this opportunity, residents banded together and formed LAMBA as an advocacy organization to secure the hogback as a potential trail center. Working with the city, they planned and eventually built a bike-suitable network on this impressive bit of geology right next to town. But the good relationship developed with the city was just the beginning. The entire city is surrounded by amazing terrain on public lands. The first fully realized bike trail was the Section 13 trail which sits on Bureau of Land Management (BLM) property just southwest of town. There was an unused parcel of land wedged between a county road and a residential area that seemed just perfect for riding. 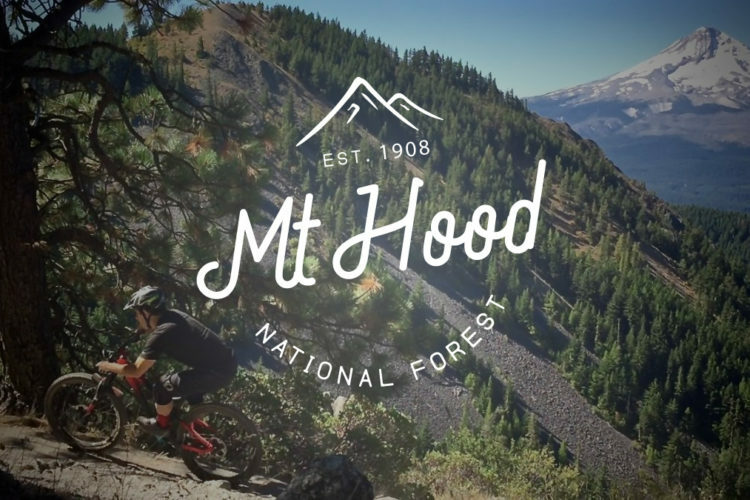 LAMBA surveyed the land and the International Mountain Bike Association (IMBA) Trail Care Crew assisted with design. Soon thereafter, a six-mile lollipop was built on the land. The loop portion was built in two phases, a lower loop and an upper loop. The lower loop was cleverly named LAMBA Chops. The upper loop is called Hot Shots, a name I was curious about. In one of those little bits of magical serendipity, there was an elite firefighting team called Hot Shots in the area to battle a blaze but, ironically, couldn’t get to the fire due to a snowstorm! Suddenly, there was a large contingent of rugged, fit, outdoor labor available, and that upper loop was cut in rather quickly. 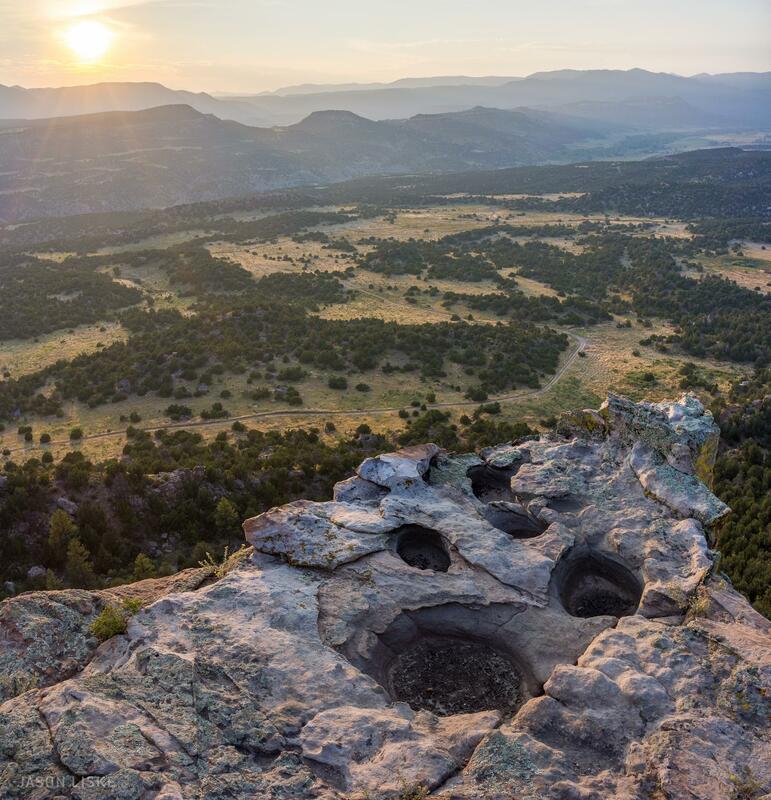 The relationship with the BLM would continue to bear recreational fruit as LAMBA would build on their success with what is the area’s centerpiece trail system, Oil Well Flats. This former mineral extraction area, which by the way is anything but flat, is loaded with terrain that just screamed to become a trail complex. Working with newly arrived BLM Recreational Planner Kalem Leonard, the partnership managed to efficiently run the planning and environmental wickets and put in place a trail system that rapidly became a favorite of riders all over the state, as well as from neighboring states. The first iteration of the trail system contained scarcely 10 miles of trail and required plenty of dirt road connections to make good loops. Since opening in 2011, the system has grown, adding top quality singletrack, reducing the need for roads, cutting in better, more interesting trail that cleverly incorporates natural features, and providing stunning views of the surrounding area. Making all this happen required the partnership to grow, and these trails were cut in with the help of Volunteers for Outdoor Colorado, the Youth Corps, and the larger area advocacy and recreational development group, Fremont Adventure Recreation (FAR), with whom LAMBA has merged. Oil Well Flats is a great system, the type almost any area would be thrilled to have, but LAMBA/FAR and their partners didn’t just look back on their creation and declare mission accomplished. Two more great trail systems would follow. 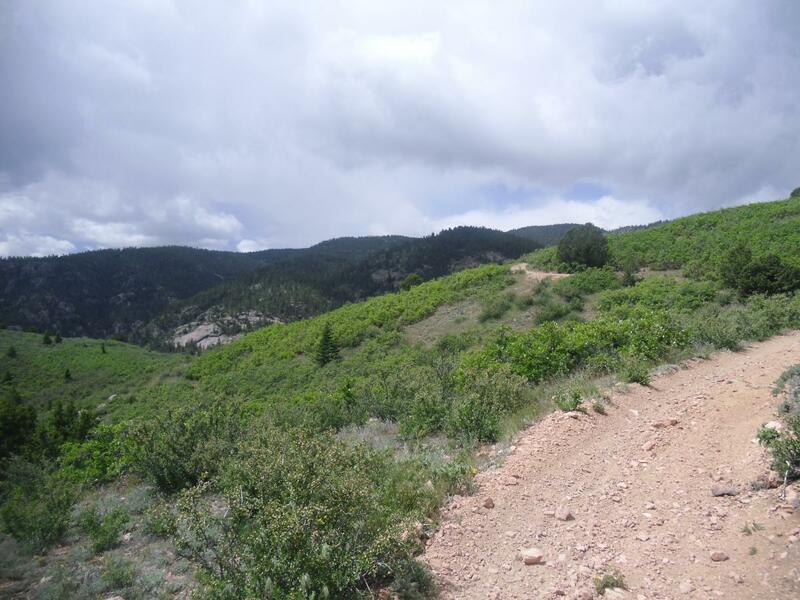 The South Canyon Trails, which are remarkable for their old-school feel despite being new construction, opened largely because Oil Well Flats had become rather crowded at peak times, and another rugged, scenic system was needed as an alternative. 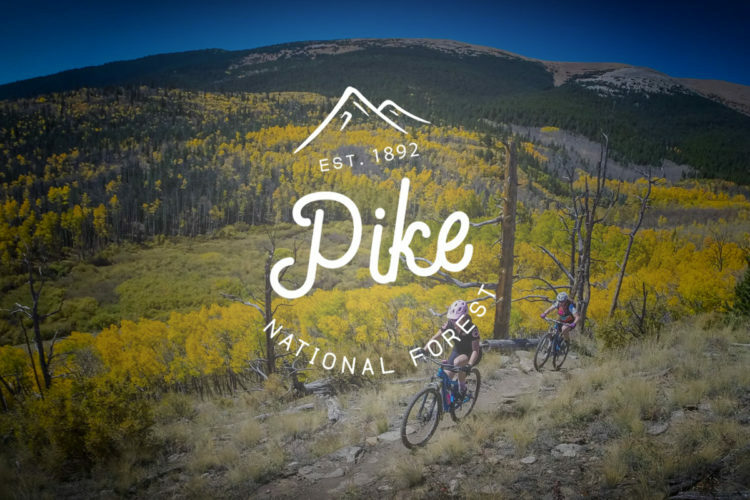 After securing a $200K Greater Outdoor Colorado (GOCO) Grant and gaining additional support from VOC, the city, and the BLM, it was clear another great trail system was on the horizon. Completing the package was the acquisition of 160 acres of private land leading into the network via a very generous donation by owners Walter and Gloria Schepp. 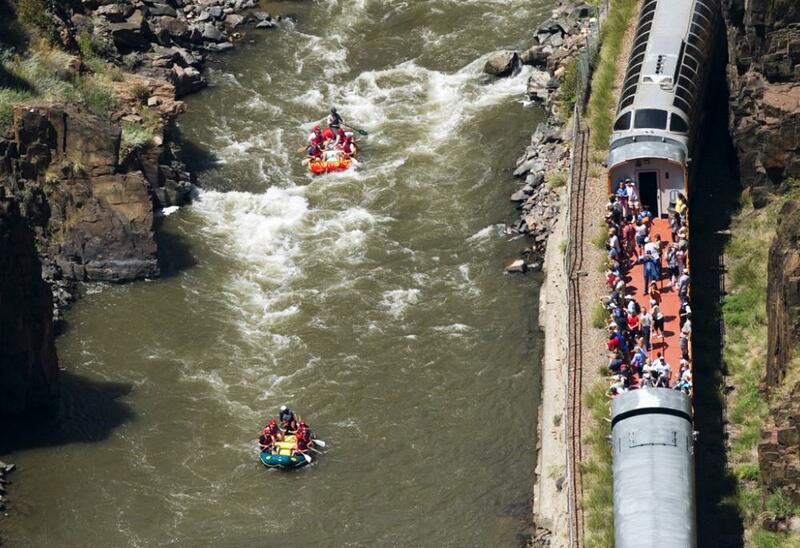 Remember how this article started off with Cañon City’s most famous landmark, the Royal Gorge? We now come full circle and close with the Royal Gorge. Although a few miles outside the city limits, much of the area around the gorge is city parkland, and proved to be perfect for another trail network. It is unique in that part of the trail skirts the edge of the vertigo-inducing, 1,000-foot chasm, but still makes for a great intermediate ride, allowing most anyone to enjoy the views and special geography. Working with the city and Steve Thomas of Terra Firma Trails, more miles of delightful singletrack are now available, with more on the books. Last year, the trail system hosted the first Royal 50, a fifty-mile mountain bike race. This required three laps, but the addition of future trails promises to reduce the amount of repetition required. 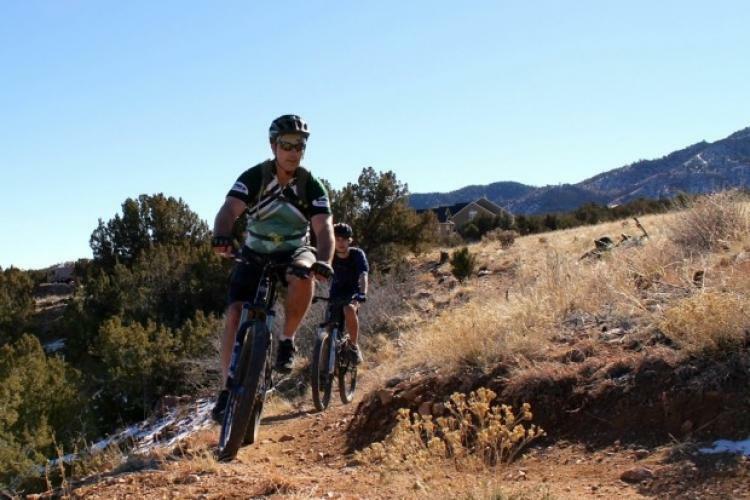 While Cañon City isn’t trying to be the next Fruita, the city has felt the benefit of their growing stature as a riding destination. The tourist season is short and, to be honest, midsummer is uncomfortably hot and dry. But spring and fall? Heaven. 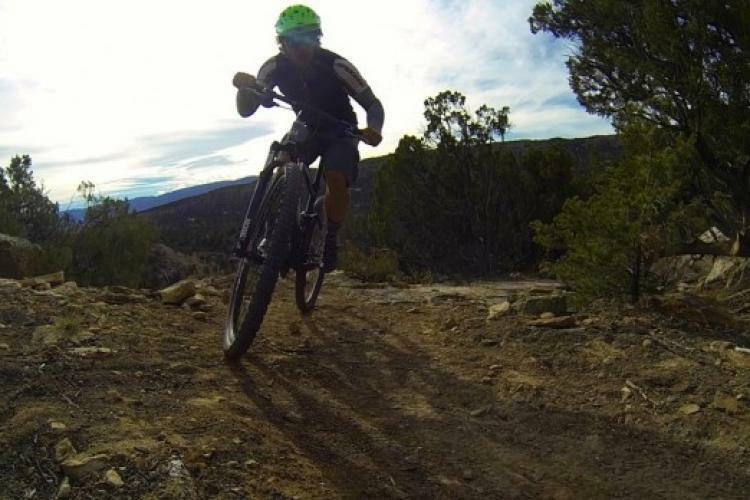 Moderate temperatures, light crowds, and the opportunity to escape the deep snows of the higher elevations make Cañon City many a rider’s “go to” locale in the off season. Local businesses especially appreciate the additional traffic in these shoulder seasons which would otherwise be scarcely more fruitful than midwinter. Ultimately, some of these starry-eyed locals envision linking some of these trail systems together into a single, massive loop around the area a la Sedona’s “Big Friggin’ Loop.” There are some hurdles in terms of access, environmental reviews, and cost, but given their track record so far, it’d be hard to count them out. Although it’s an hour away and I have plenty of great trails right here in Colorado Springs, I see myself making many journeys to Cañon City for years to come. Not bad for a small city full of prisons and old people. Keep reading to get a detailed description and killer photos of each of the trail systems mentioned here. I have enjoyed writing many of Singletracks’ “Five2Ride” series articles. 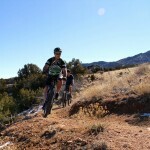 With five excellent newer trails built in recent years in Cañon City, it’s a perfect candidate for a Five2Ride entry. 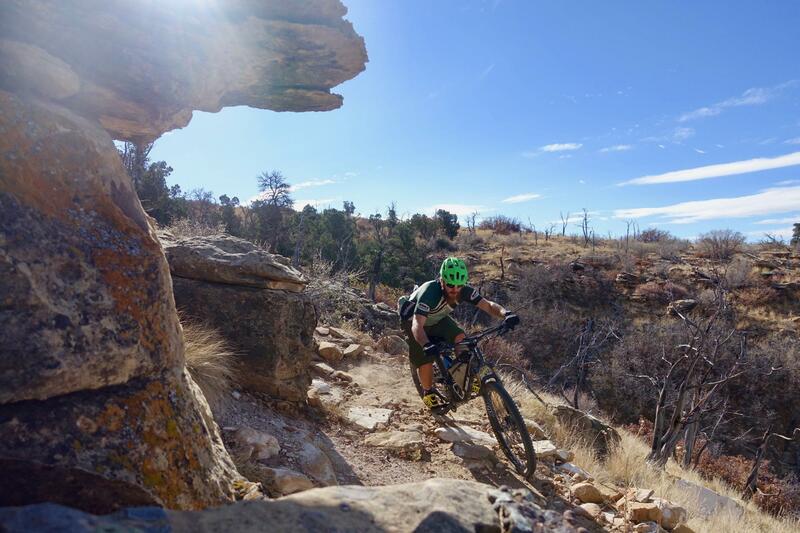 So here, as an appendix to the story of Cañon City’s ascent as a mountain biking destination, is your Five2Ride description of the great new trails. 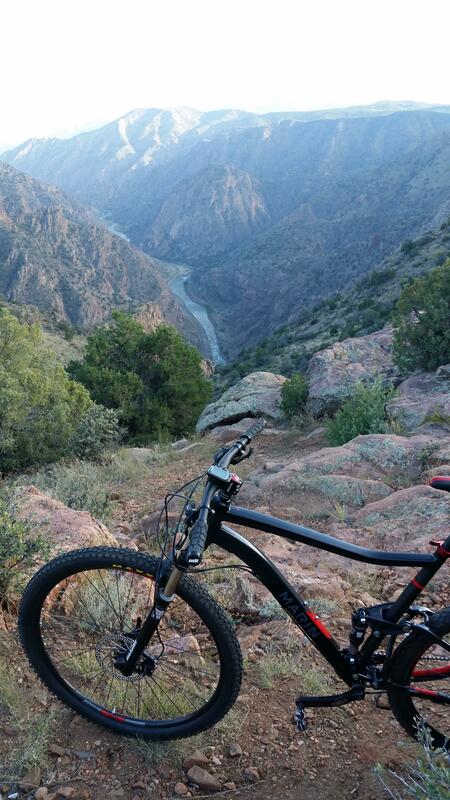 Section 13 was the first in the line of five great new trails built around Cañon City. It is a wonderful addition to the area’s choices, and the first all-singletrack loop available within close proximity to town. At only six miles long with under a thousand feet of elevation gain, this lollipop loop is neither epic in distance or technical requirements, but it is a fun trail for most. It is mostly novice-friendly with but a few rocks and only one spot with mild exposure. Section 13 relies on fast flow to be worth a trip, and that it does well. The climb is gradual, leaving plenty of energy to enjoy the ride down, which is on a perfect pitch; just steep enough to keep rolling, but not so steep as to need much brake. It’s a blast to see how quick you can pace a lap by mastering your cornering technique. A unique feature of this trail is that even with little elevation gain, it spans altitude-driven geographies, with desert sagebrush below and montane pine forest above, making for a nicely varied ride in a relatively short loop. 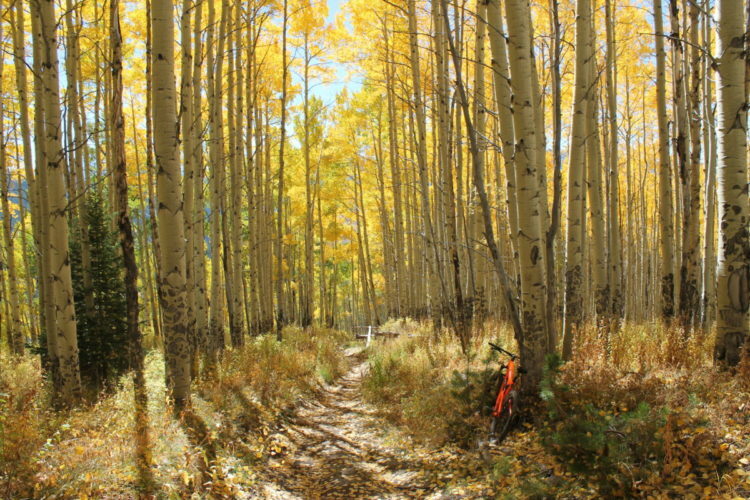 As nice as Section 13 was, it was but a warmup for what would become Cañon City’s signature trail system, Oil Well Flats. The Oil Well Flats system takes excellent advantage of the unique topography lying along the Shelf Road to Cripple Creek, just north of Cañon City. The faulty, ledgy rock presented many opportunities to incorporate natural features into the trails, and this trail system takes maximum advantage of that. There are serious climbs and speedy descents, but in this trail system, the level traverses up and down the rocks, bobbing and weaving through the pinions, which can be even more fun. 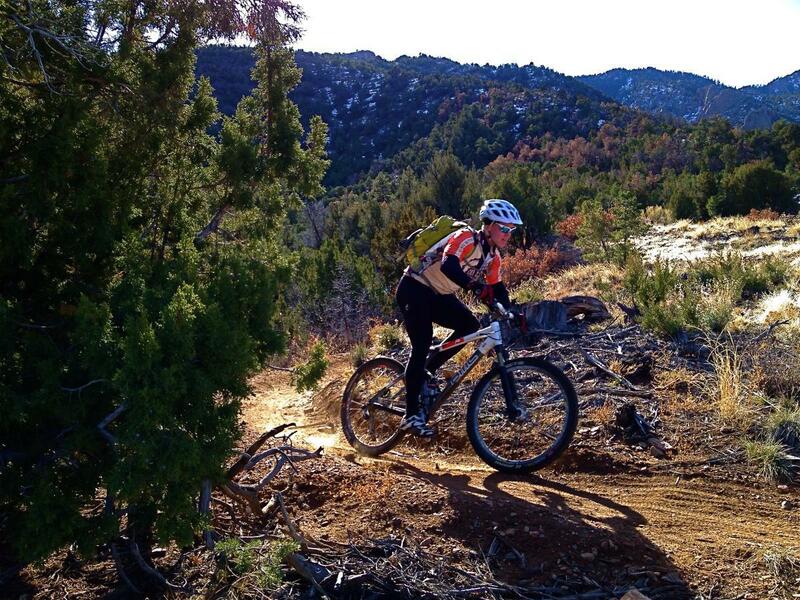 The Oil Well Flats trail system opened to rave reviews with around 10 miles of top-quality singletrack. Since then, the system has grown to over 15 miles with a great variety of loop opportunities so any rider can customize both length and technical challenge. In addition to the great riding, the scenery can be awe inspiring, especially from the top of the highest canyon wall on the aptly named Island in the Sky trail. Along the western edge of town, a sharp hogback rises, offering a convenient opportunity to get some shred in. Like Section 13, the Hogbacks doesn’t offer up a lot of mileage. However, these trails are even closer to town and, unlike Section 13, the Hogbacks do offer some opportunity to get in over your head. Some of the downhill segments connecting the traverses will invite most riders to dismount. These segments are short, but just gnarly enough, and sometimes lined with unforgiving cholla cactus, to make many riders think twice about blindly charging down. The ridge top is akin to a knife edge with occasional exposure to both sides, and the top of the world position provides excellent views of the entire area. A bot of exposure in the South Cañon trail system. On my first trip to Cañon City with my bike, some years before all this trail building frenzy began, I inquired at the local bike shop as to where to ride. I was given some sketchy directions to an opening in a fence on the southwest corner of town and told to just go explore. What I found was some sandy desert singletrack and one nice segment weaving through the scraggly desert pines atop a short mini-ridge. It was nothing to write home about. Two summers ago, that low ridge became the starting point for another stellar trail system, this time hopping up to double-digit mileage and extending well up into the adjacent mountains to the west. 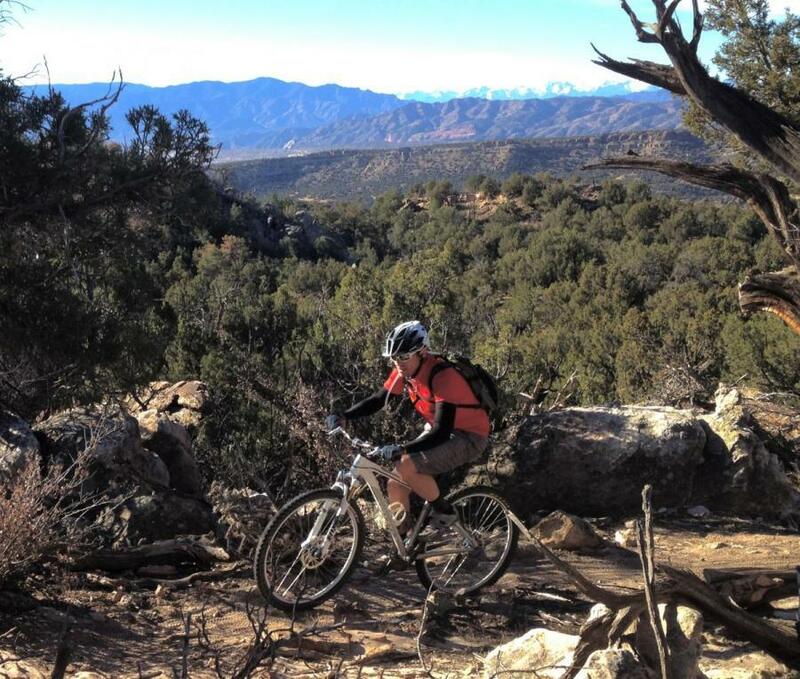 The South Cañon trail system provides a unique and sometimes challenging ride with multiple loop options covering a variety of desert and mountain topography. 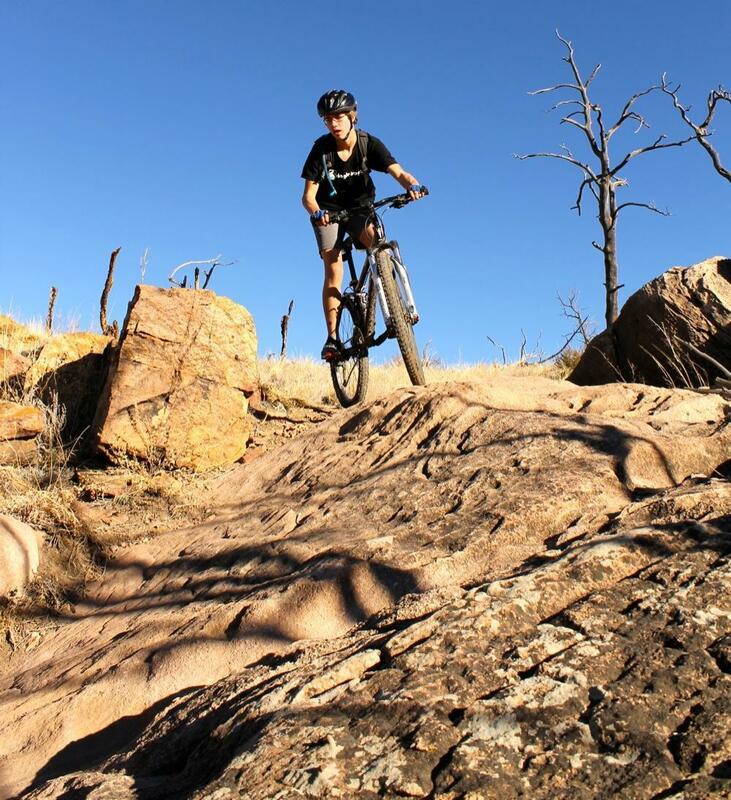 While Oil Well Flats remains the area’s premier trail system, there are actually riders (sometimes myself included) who prefer South Cañon’s rough-hewn and sometimes awkward lines to the more ride-friendly Oil Well Flats. I give huge kudos to the locals for adding a very old-school feeling, rugged but entertaining trail system to the Cañon City menu. One of the best features of this unique trail system is that the lower trails are novice-friendly and make for a great introduction to the sport. 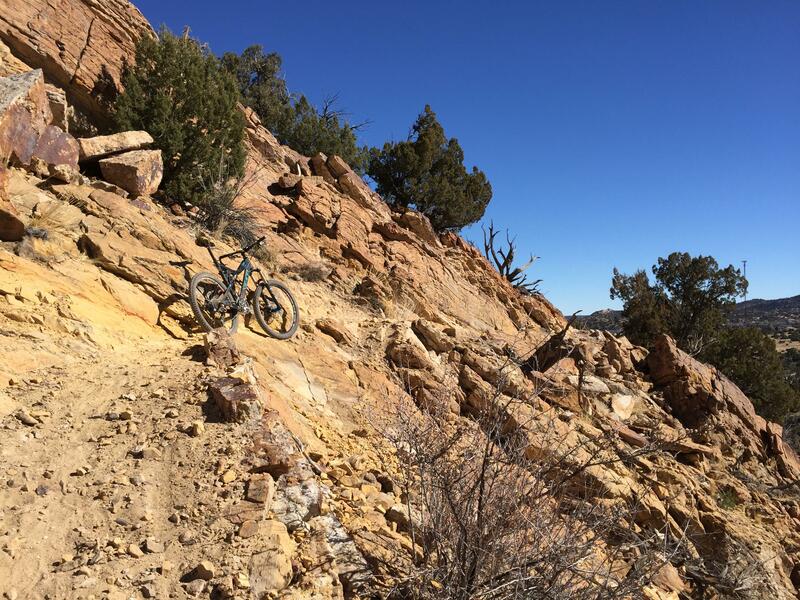 So while the upper trails require solid effort and skills, even the expert rider can take advantage of the natural warmup and cooldown built into a full South Cañon tour. Looking across the 1,000+ foot deep Royal Gorge from the Rim Trail. 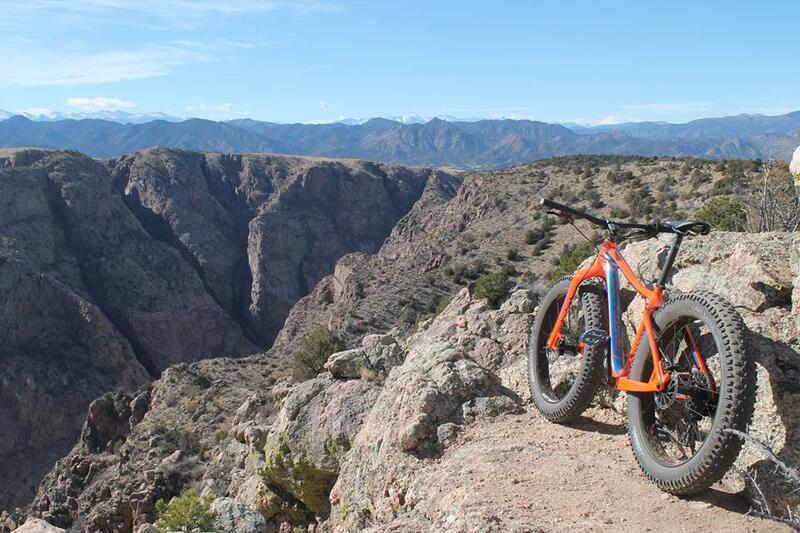 The big hole in the ground that provided the inspiration for Cañon City’s name now provides another double-digit mileage collection of superb singletrack, and further adds to the variety of views offered in the area. 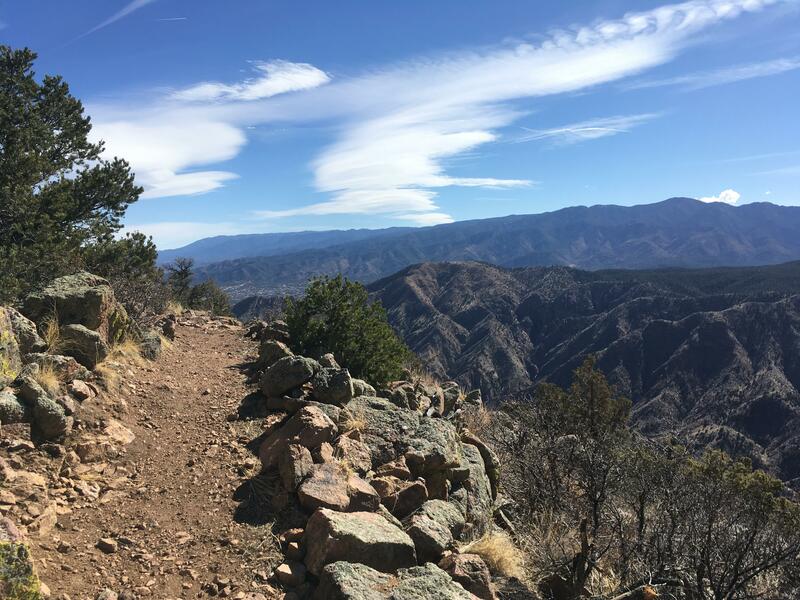 Like Oil Well Flats, the Royal Gorge trails opened with modest mileage, but have consistently added to that, creating plenty of reason to journey a few miles west of town to crank out some miles. This place is a cross country rider’s dream, with plenty of ups and downs, and new and unique scenery around every bend. The pièce de résistance is, of course, the portions of the system that run along the edge of the great gorge. There are places where it’s best to stop the bike and dismount so as to safely gawk over a thousand vertical feet down to the Arkansas River below. But don’t think this ride is just about the scenery. The riding is stellar, especially if you’re more interested in crankin’ and bankin’ than you are in putting yourself in mortal danger on relentless gnar. However, if you can’t have fun without pulling some stunts, you can find some excellent optional lines. On a personal note, this is one of my all time favorite places to ride a fully rigid fat or plus-size bike. Great to see trails being built there. It’s been over a dozen years since I moved away. At the time it seemed like I was the only mountain biker in the area. Back then the hog back had just been closed to motorcycles and I spent plenty of time on the old dirt bike trails . I remember there being an old road cut that split off from Skyline drive. I tried to piece together some loops out of the climbers trails at Shelf Road. I imagine some of my cattle trails at Oil Well Flats are legit trails now. I even maintained an old forgotten trail I found across the road from Oil Well Flats on the fringes of the old shooting zone. I wonder if anyone still maintains it. My favorite ride however was south of town on Oak Creek Grade. Taking Stultz Creek to the top of Tanner Peak and sometimes dropping down Bear Gulch. I guess even then I liked the adventure rides. I think it might be time to head back some fall. Then again I remember cholla. I hated cholla. Another great article John. 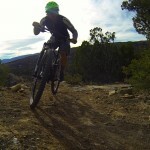 Canon City has some of the best riding in the Front Range. Each spot is very different from the others and the trail quality is way above average. The trail builders have done an amazing job and deserve a lot of credit. There is enough riding to make it a true destination stop. Great off season times make it even more special during late fall through early spring. OWF is one of the most intelligently built areas I’ve ridden anywhere in Colorado. All of the areas you mentioned offer great riding- not one of them is a let down. As you said, not quite Fruita yet, but amazing.